This evening I came across a very interesting VSAN knowledge base article KB 2073930 which states: to support a VSAN Cluster with greater than 16+ nodes, an ESXi Advanced Setting must be configured. The wording in the current KB is a bit confusing as it mentions the advanced setting must be applied to all hosts and then it mentions it should only be applied to the "additional" hosts. I have reached out to engineering and confirmed that the setting should be applied to ALL ESXi hosts and the KB will be corrected shortly. After applying this setting, you will also need to reboot your ESXi host for the changes to take affect. To assist with this change, I have created two scripts: vSphere SDK for Perl and PowerCLI which will automate the configuration of this advanced setting for ALL ESXi hosts within a VSAN Cluster. 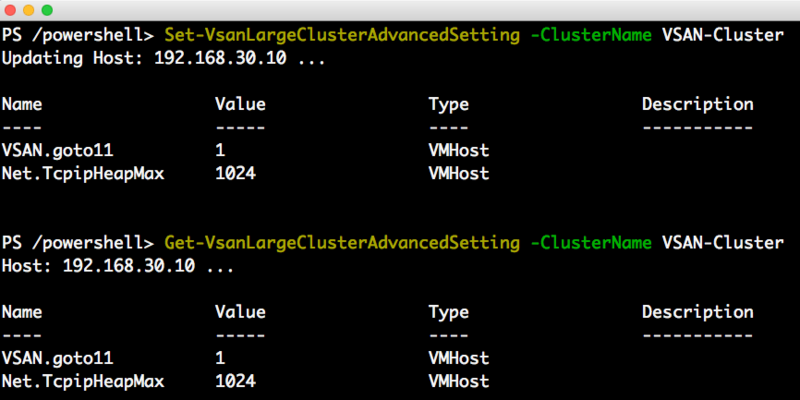 UPDATE (07/27/17) - Here is a PowerCLI script called VSANLargeClusterAdvSettings.ps1 which contains two functions (Get-VsanLargeClusterAdvancedSetting and Set-VsanLargeClusterAdvancedSetting) for retrieving and updating the necessary ESXi Advanced Settings to enable large vSAN Clusters for ESXi hosts running on 5.5, 6.0 & 6.5. There are two different KBs depending on the version of ESXi, please see https://kb.vmware.com/kb/2073930 and https://kb.vmware.com/kb/2110081 for more details.